Lately in Rakugo there’s been a pretty evenly split focus on the private and public (read: performer’s) lives of Kikuhiko and Hatsutaro. Episode 4 felt more heavy on the private side. Kikuhiko has unsurprisingly lost some optimism in Sukeroku’s “bright, righteous future” in light of adult responsibilities. We knew this was coming. Episodes 2 and 3 were full of the beautiful and magical but very temporary allure of growing up. The two young men still share an irreplaceable and comfortable bond, but the bloom is a bit off the rose. Kiku has taken a day job as a waiter (artistic reference), balancing rent and basic needs with continuing his Rakugo path. Hatsutaro - who has now taken the familiar name Sukeroku - isn’t much for working and the non theatrical, non drinking (artistic reference) world, and he continues to overshadow his friend in skill and popularity. Kikuhiko wants to improve as a performer, but ironically considering where he ends up in life, doesn’t have interest in rising to the very top. Or does he? The Kikuhiko in this episode has settled into himself as an adult and as a man, but as a performer he’s back in Sukeroku’s shadow. In fact, we don’t even see him perform in this episode. 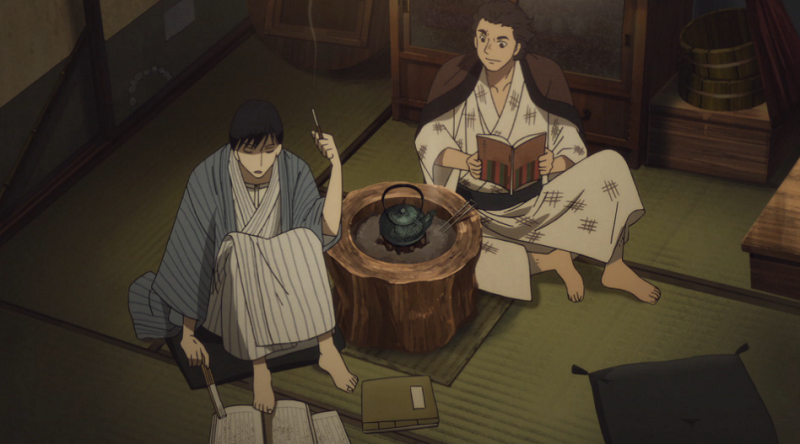 In the last episode, it took being completely independent of his friend and teacher to find what Rakugo truly meant to him. Now that his support system - and rivals - are back in the picture, Kiku has gone back to being upstaged. To make things worse, Sukeroku continues to win people over largely due his natural talent and charisma, while Kiku’s fastidious nature backfires. In this transitory period where the strain between Kiku and Sukeroku is just beginning to feel real, another character comes in who could - and very likely will - change everything. Miyokichi, a beautiful woman the boys’ master met in Manchuria and has now started her training as a geisha, takes a liking to Kiku. Someone on my twitter feed (wish I could remember who) pointed out during episode 3 that when Kiku has scenes with women who are romantically interested in him, they are set in open, public spaces, in contrast to the very intimate, closed-off scenes with Sukeroku. Miyokichi is the first woman we see Kiku have such a private relationship with. It’s interesting not only because it threatens the friendship that has been the core of the show so far, but because both Kiku and Miyokichi have forward-facing personas that hinge on eroticism and capturing and audience. Although Kiku seems wary of the relationship, it’s obvious that he’s genuinely intrigued by her. In just a few short scenes, this is the closest he’s come to the level of intimacy he and Sukeroku have with a woman, or any person for that matter. 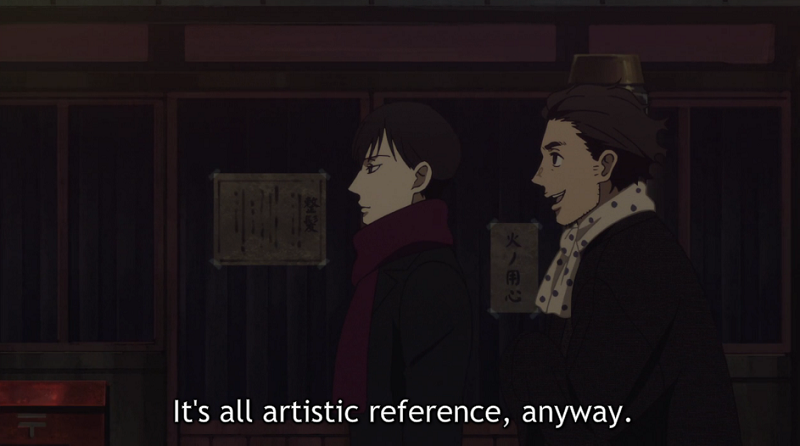 Like a lot of things in Rakugo Shinju, there’s a palpable undercurrent of tension to this development. We know the relationships between Kiku, Sukeroku, and Miyokichi will lead to complicated and tragedy, we’re just waiting, helpless, for it to play out. For now, Kiku can’t help but go where this new feeling is taking him. P.S. sorry this post is later and more rushed than usual. I moved over the weekend and had some big life changes to my time and routine.